Same wildly popular designs new exciting colours! Army green, sport grey, dirt brown and pink. 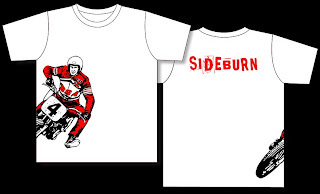 AND we have hefty XXL sizes in red and white only. 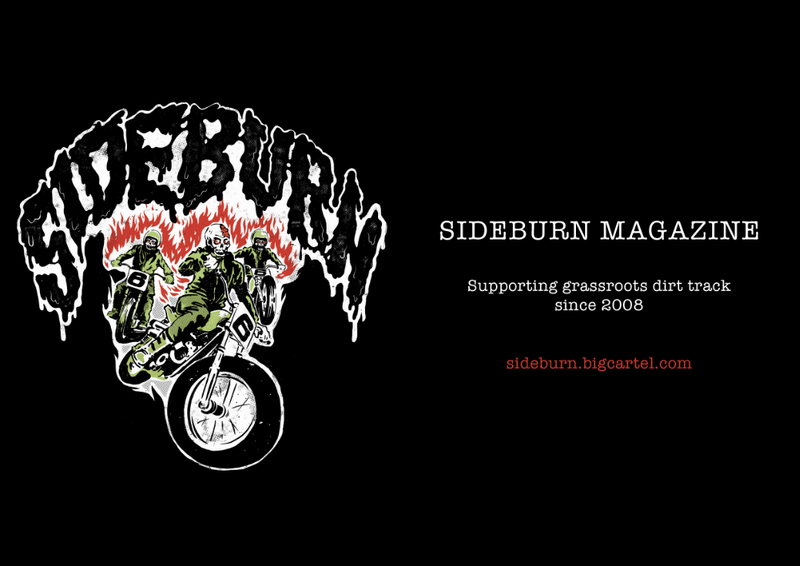 Go to www.sideburnmagazine.com then shop! Yup, yup. 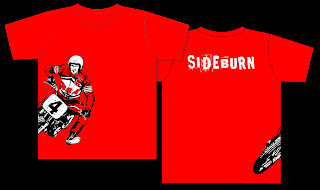 SB#2 is in the pipeline, taking the art of Turn Left racing to the next level. It's my birthday today. I had to work, but it's not proper work. 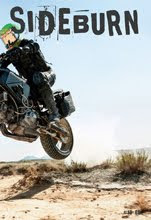 I was riding around on a 1978 Mad Max replica Kawasaki for Classic Bike magazine. 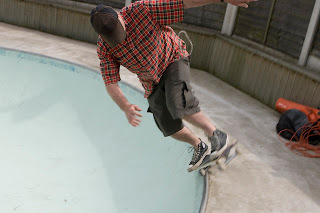 I managed to hook up with Dave from Skooter Farm and watch him skate his homemade California-style pool in his backyard. He lives 200 miles away so it's good to meet when we can. 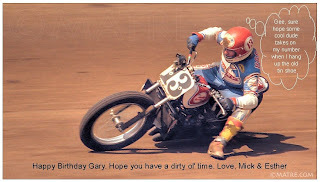 Then I got home and my good friends Mick and Esther from Rome sent me this cool e-card. 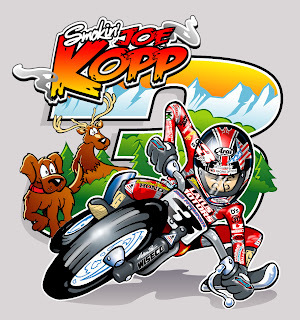 I've got over the ego wounds of my last race enough to look back and realise the final was one of the hottest ever in the UK. Current champ Marco Belli drove over from Italy and was on his new new CCM (more about that rocket soon). 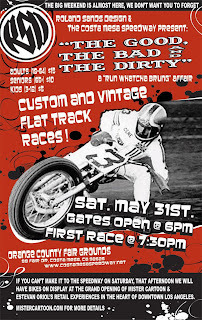 In the semi he was crossed up out of turn 4 with the front wheel in the air on the first 6 laps. 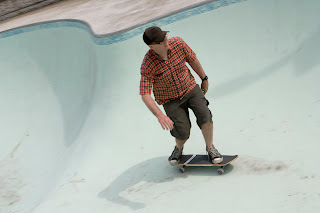 He looked unbeatable. 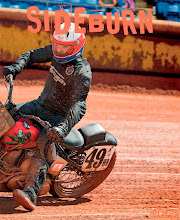 But Sideburn's favourite dirt tracker of all time, Peter Boast, skinned him in the final leading from start to finish. 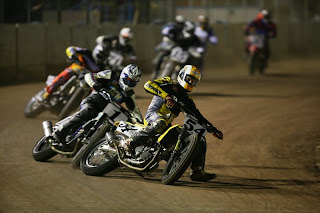 If you want to check out UK racing there's a non-championship round in Peterborough on May 17. 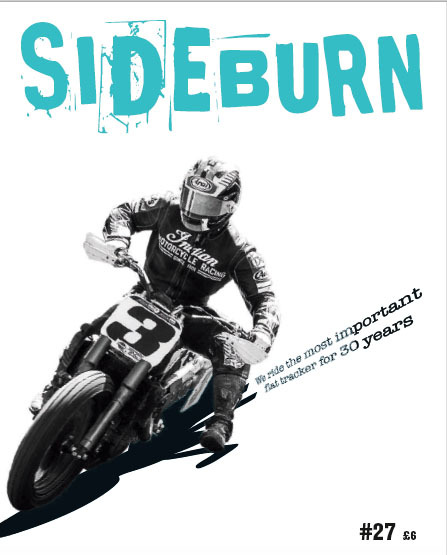 I (Sideburn's GI) won't be racing as I'm working at the NorthWest 200 road race in Northern Ireland. 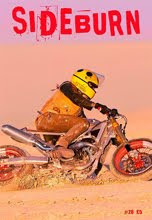 But I will be at the fantastic half-mile in South Wales on June 7. 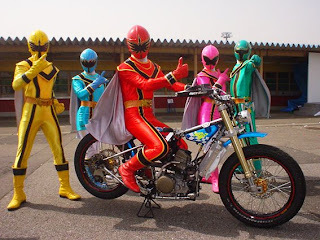 Here is a photo I found on the internet a while back. 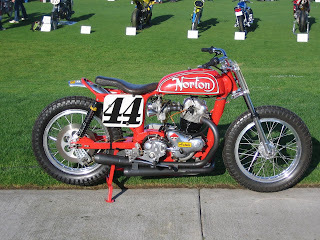 It is one of Ron Wood's Norton's, he had 2 that I saw and they flew at Ascot. 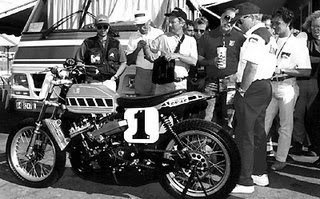 I know that one of his Norton's was the last Norton to ever win a national (Ascot, with rider Alex Jorgenson(pretty sure). They are works of art. I have all sorts of cool stuff floating around. We didn't know that. 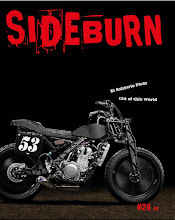 But he has a blog lots of magazine types read and some of those types have bought Sideburn too. They said this review Tim put on his blog is why. 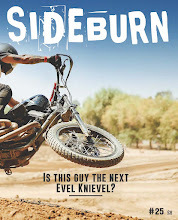 If you haven't bought SB yet, read on. 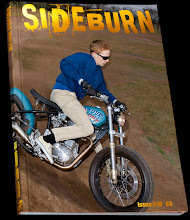 Last night I had a stark reminder of the power of a printed magazine: its name is Sideburn. 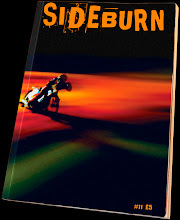 Sideburn is an A5, perfect bound, 82+4, full colour throwback – or rather, it is the classic iteration of journalistic passion. 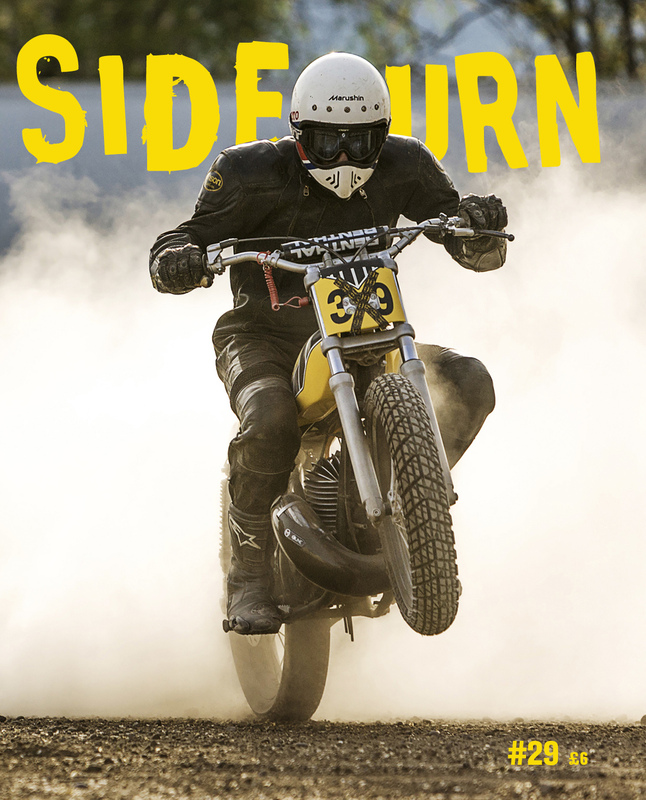 Produced by two guys in a small town of the flatlands that surround FormerEmap's motorcycling centre of operations, it is all about, and only about, flat-track motorcycles and the people who build and ride them. In grown-up commercial terms, that's a niche of a niche of a niche. In reality it's a fantastic magazine, full of the kinds of machines and people I love to know about. 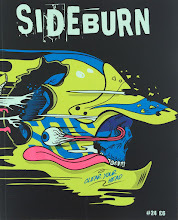 For all the teaching I do about professional magazine craft and the digital future of publishing, Sideburn contains one eternal lesson. When you come down to it, there is nothing, NOTHING, to beat passionate editorial in a mobile product. Totally, unconditionally mobile. No electricity or signal or wireless network needed. Available anywhere, anytime. Don't know much about the artist/visionary behind this except he's Italian, his name is Oberdan Bezzi, he's excellent and he's prolific. 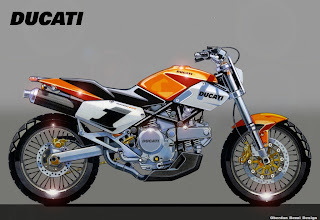 This is his 1000cc Ducati Street Tracker. Be pretty easy to replicate in real life. Let us know if you do. 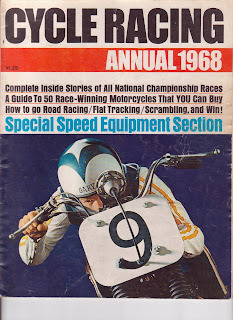 We've had plenty of racers buy SB 1, but when George Roeder II sent his dollars through we got pretty excited. A true mile maestro. And from good stock. Thanks George. 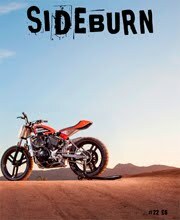 Sideburn's mate, Marc Abbott, went on the Spanish launch of the new Harley XR1200 roadbike for quality UK bike magazine Performance Bikes. Scott Parker was guest of honour (honor if you're American) and every journalist was given a number 1 plate signed by Scottie. 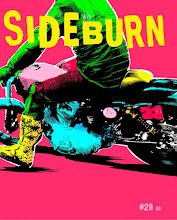 Marc, dear, dear Marc, donated his to Sideburn HQ. We love you Marc.